For more about our authors and photographers, and how you can contribute and essay, story, artwork or photo. Shades of fluorescent orange, used to color the dawning day, dripped from the palette of the celestial artist to set the autumn woods on fire. Waves of celestial orange roll over the treetops to set the autumn woods ablaze. The white, early morning autumn mist hung motionless above the flowing dark water of the South Branch. As dawn approached, the rising sun turned the eastern horizon into a glowing red-hot coal that lit the pale mist with an orange blush. The trees along the river were immersed in the flood of pre-dawn mist. Some completely hidden and others partially protruding as dark brown silhouettes floating adrift on a misty sea. As the sun arose, it was as if watching an artist at work laying base colors and adding tints to bring a charcoal sketch to life. The changing light and rising temperature caused the orange mist to vanish as entire trees appeared from the mist, revealing splotches of vibrant fall color. It is easy to imagine the changing colors of the sunrise were infused into the river mist to wash over the treetops and set their leaves ablaze. 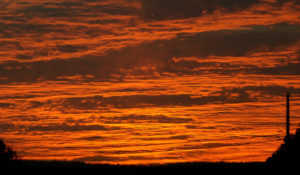 The same spectrum of color seen in the eastern sky at dawn can be found in the fall foliage not flooded by river mist. The full visible spectrum from violet through red and orange, to pink, salmon and yellow are shared as the tree tops meet the sky’s loaded paint brush. A mere splash of color in early autumn is all that is needed to set the late October woods ablaze. Each living drop of color slowly expands to cover the entire leaf as the season progresses. Its radiance now sets adjoining leaves aglow until the entire woodland canopy is bathed in bright color. Retreating skyward to a time lapsed satellite view, the expanding colors can actually be seen migrating south. The green foliage appears to be consumed by the advancing flames of the autumnal fire. Poetic inspiration imagines it is the weight of intense color that causes the leaf to depart the branch. Gusts of wind stir the treetops to recruit a shower of shimmering color in a free fall final dance for which the tethered leaves had been rehearsing since spring. 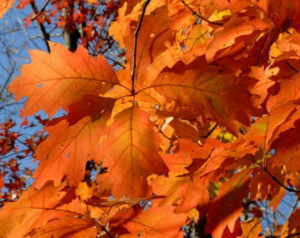 The first leaves to fall are contributed by the black walnut and ash trees. Impatient for some reason to drop their leaves. They stand naked among the still well-dressed oak and maple associates just beginning to change color. A stand of Norway maples grew thick along a low ridge that bordered a sloping cornfield. Their brilliant yellow leaves carpeted the ground and reflected light upward to brighten the understory and set the leaves aglow. The lowest leaves fought for their share of light all season and grew oversized in the effort. The reflected light penetrated the deep shade to illuminate these outsized yellow beacons to celebrity status. The change of leaf color during autumn has a well-established scientific explanation. Though a longer held belief declared, without question, the color was the work of an ethereal magician. It is easy to subscribe to that belief when you see a green leaf turn fluorescent orange, a color otherwise unknown in nature. The only place to see that color was in the flames of a fire or in the distant heavens to mark the sun’s arrival and departure. The fall color is best seen as magic, to set your imagination free and escape to a quiet place where all things are possible. For this visit to my assigned assessment site, I had new members of my ‘team’. It so happens that two of my godsons were visiting from London, UK, where they reside and go to school. Alex, 14 years old, and Mathieu, 12 years old, were presented with the option of participating as full team members to do a stream assessment at the Ambrose Brook. They readily agreed, and we set off for the stream site. The day was partly cloudy upon arrival and proceeded to get more clouded over as our time at the stream advanced. I appreciated very much the extra eyes and hands, given that it would take a group effort to undertake and finish all the measurements required of the assessment. It was so nice to have the company and the opportunity to share this activity with them. They asked some pertinent questions in regard to the site, as well as concerning the focus of the project. We were armed with marker flags, tape measure and ruler, thermometer, stop watch, and the required forms to fill out. In addition, as a nod to my own childhood, I had dug out of storage the red plastic duckie that I had used so (too) many years ago when I was a child. After having sealed the seams with glue, it proved to be water ready and floatable, and was thrown into our equipment bag. Upon arrival, we did a quick survey of the site. I gave the boys an overview of the project as we walked the required distance to mark off where we would take our measurements and set our marker flags. We were not particularly surprised to note that summer was on the wane, and the stream site showed the effects of the copious summer rain fall of this year and the subtle yet visible march of time on the greenery. There were a few trees already beginning to drop some leaves, apparent at their base as well as at the edges of the stream. Some windfallen branches had made their way into the stream on both sides, evidence of the frequent storms that had buffeted our area during the preceding summer months. In addition, the water level had risen, as marked by mud splashes on bushes, trunks and the mud banks. 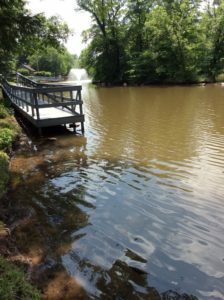 There were a few ducks and Canadian geese, who had vacated the surrounding lawns and walkways; that day, they were floating lazily on the water’s surface between the far bank and the island, oblivious to our presence. At that point, the boys and I got to work. Alex and I did the physical measuring, including wading to the middle of the stream to measure depth and velocity, while Mathieu took on the role of scribe and stop watch handler. The first order of business was to observe, consult and come to a shared decision in regard to water conditions. My team mates took their jobs seriously and we were able to arrive at mutually acceptable readings of turbidity and stream flow. The next order of business was to measure width, depth and velocity. Armed with the rubber duck and ruler, Alex waded to the starting point while I headed in the opposite direction. Mathieu had been instructed in the subtleties of the stop watch, and as the two of us with wet feet called out the various measurements and Mathieu proceeded to fill out the form. All of us – Alex, Mathieu, me, and the rubber duck – showed ourselves up to the task and we were able to finish that part of the assessment in due time. After exiting the stream, it began to rain, so the three of us made a mad dash back to my vehicle, where we took refuge and worked through the rest of the form. The boys were more than willing to express their views in regard to stream characteristics as well as all the elements of high gradient monitoring. We reviewed the results in order to make sure that we were of one accord in regard to our observations and conclusions. They did a wonderful job of giving themselves over to the project, with determination, seriousness, intellectual curiosity, good humor, and dedication. After approximately one and half hours, we took our leave and headed to a nearby ice cream parlor for a well-deserved reward. Their company and participation were most welcome and I hope that this experience will inspire in them the desire to become involved with environmental projects of their own, whether on their own or in conjunction with their school curriculum. A moment in the sun. The elusive and rare bog turtle, aka Muhlenberg turtle, is captured in this image by Brian Zarate. 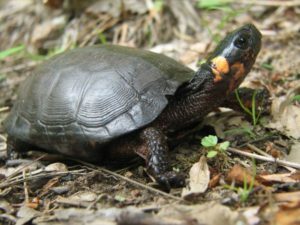 The smallest and rarest turtle in NJ has emerged from the obscurity of its muddy bog to celebrity status as the bog turtle was recently named New Jersey’s state reptile. 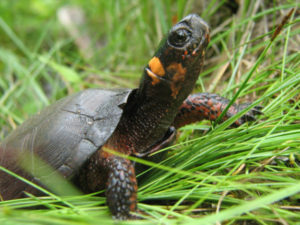 The bog turtle was first scientifically cataloged by botanist Gotthilf Muhlenberg at the approach of the 19th century. In honor of the discoverer, this diminutive reptile was named Clemmys muhlenbergii. It was commonly known as the Muhlenberg turtle until the vagaries of taxonomic nuance christened it the bog turtle, one hundred and fifty-six years later. The bog turtle averages a bit less than four inches in length. To visualize its size, write its scientific name on a piece of paper and that length will approximate the size of the turtle. The blaze orange patch on the side of its head provides unmistakable and instant identification. The orange color glows like a brilliant gem. Stare at it for a moment and the turtle magically materializes from its muddy background. The overall appearance of the turtle is a grayish black, though on closer inspection there are varying degrees of dull orange skin and freckles especially at the base of the front legs, neck and face. The carapace or ‘top shell’ is covered by ridged scutes or horny segments, comparable to fingernails. Faint amber markings may sometimes be seen on the shell, their appearance dependent on age or accumulated mud. The small size, secretive habits and specialized habitat requirements restrict the presence of this turtle to very defined regions of the state. As its name suggest, these turtles prefer open boggy areas fed by clear springs or streams. Skunk cabbage and jewelweed, aka, ‘touch me not’, are easily identifiable plants commonly found in bog turtle habitat. Pasture lands are desirable locations as plants and grasses are kept in check by grazing cows to maintain optimum preferred habitat. Deep mud, constantly infused with spring water, provides ideal hiding places and protection from freezing during winter hibernation. Tree stumps protruding from the bog and raised islands are preferred locations to lay eggs. Females seek these drier places within the bog to lay eggs as opposed to other turtle species which travel quite far from home. To illustrate the secret life of the bog turtle, a friend who was a conservation officer, stopped to investigate a car parked alongside a road in north Jersey. He came upon two researchers following signals from a bog turtle equipped with a transmitter as part of a study project. Nothing could be seen to indicate a turtle was present. The signal, however, indicated its precise location and after digging deeply into the mud, there was the turtle alive and well! Bog turtles are considered to one of the rarest turtle species in the United States. The bog turtle had been declared ‘endangered’ by the state in 1974 and ‘threatened’ by the US Fish and Wildlife Service in 1997. Population estimates are speculative, as some articles cite the total population in the eastern US as 2,500 to 10,000 and ‘fewer than 2,000’ turtles in NJ. The Bog Turtle Project states 168 colonies have been identified. Equal distribution of 2,000 turtles over 168 locations cannot be assumed and further emphasizes the rarity of this precious gem. Among the locations identified, there are a select few, which have a large enough gene pool to ensure a viable population into the future. While turtles found in isolated micro habitats are vulnerable to insufficient genetic variation. In both situations the loss of contiguous habitat is a deadly threat, as a segmented environment limits migration and thus genetic variation as well as exposing animals to predators, mowers and vehicles. Loss of habitat is a major threat to bog turtles as well as many other species. 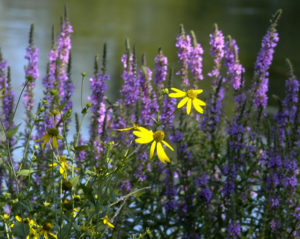 Invasive plants, like the familiar purple loosetrife and phragmites, dominate areas to destroy plant diversity and alter soil porosity which in turn eliminates the cascade of insect and invertebrate life upon which the bog turtle feeds. More turtles may yet be found by wild chance, though by no means can their presence be considered widespread as is the case with more common species like painted and snapping turtles. Suffice to say the description of ‘rare’ is understated when used to describe the bog turtle. The designation of ‘state reptile’ is not an endearing term to the general population. I like to think of the bog turtle, as one in a series, of New Jersey’s unheralded natural treasures. More references for bog turtle information. Should you find a bog turtle, report it and keep the location secret, as this turtle is high on the list of the illegal wildlife trade. Whenever I see a turtle, I always wonder how old it might be and compare it to events in my life. Most age ranges provided for wild creatures are speculative and based on captive animals or hard data collected from tagged wild animals. A bog turtle tagged in 1974 and estimated to be about 30 plus years at the time was again found in 2017, which places its estimated age at around 65 – 70 years old! That age range allows young and old to ponder what was going on in their life at any point in that turtle’s parallel life. Thirty something years ago when that turtle burrowed deep into the mud to hibernate, my daughter was born in Muhlenberg hospital. A local hospital named after the son of the discoverer of the bog turtle, aka Muhlenberg turtle. The legislation to proclaim the bog turtle the official state reptile was co-sponsored by Kip Bateman of Branchburg. It would be a further coincidence to find and report the discovery of a bog turtle community within Branchburg! So summer is in full swing – I made a visit to the Ambrose Brook immediately after the summer solstice, on 24 June 2018. The environs have changed in several ways, both passive and active. There are several aerating fountains that spray a cool mist that is distributed by the shifting breezes off the water. The highwater mark on the center island has changed since I last visited, probably because of late spring run-off. 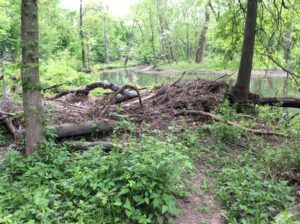 But the water has even been higher, as evidenced by the residue on all of the banks, the tree roots that extend into the water, and the low-lying bushes. All are wearing a dusty mud color that gives evidence of water that has since receded. Water flow has significantly strengthened, as is noticeable over the modest waterfall close to Rte. 28. In addition, the rain run-off in the two drains has increased, so that more than a trickle from both of them is observable as it enters the brook after the waterfall. Fauna have increased. 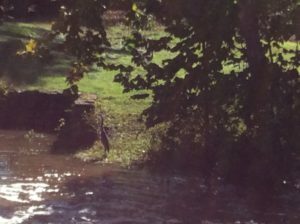 One of my prize observations was that of a somewhat lazy or perhaps sleepy but wary blue heron standing on just one leg somewhat in the middle of the stream, past the waterfall. I tried to ease my way in a stealthy and languorous manner along the bank to not call attention to myself, but alas, the heron quickly reacted to my not so subtle approach, was on to me as I slowly worked my way toward the lovely bird . S/he dropped the second leg into the water, turned a cold shoulder in my direction, then deliberately moved away from where I had planted myself on the bank opposite to his/her position. Even though the distance between us stayed about the same, I was so taken by the proximity of this lovely creature and my ability to observe without causing a startled reaction. 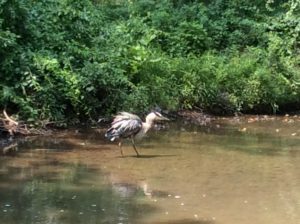 S/he continued a slow and deliberate saunter down the creek and disappeared around the bend. What a treat to be able to be a silent observer of a stream visitor. Nice! Another observation is that butterflies and moths inhabit the environs, with several Monarchs making their graceful presence known as they fluttered past and through my line of vision. Their wingbeats cast a silent beat to the pulse of the planet as they made their way over and through the environs. Human presence has also increased. It should be noted that the four walkways that run over and parallel to the stream offer an unobstructed view. And all of them are handicap accessible either all or in part. In other words, on all of them ramps are available so that proximity to the stream can be achieved. People who are fishing on the walkways are only part of the traffic. There were several runners, families with tots and strollers, and other quiet observers to finish out the panorama. My next visit in July will be for another stream assessment, boots, thermometer, floating duck, ruler at the ready Happy summer, everyone! My South Branch office is made of kevlar and weighs 52#, well lit with natural light and leaves no trace. A perfect vehicle for discovering New Jersey’s natural treasure hidden in plain view. Every once in a while, it is useful to check your back trail to validate your current course. 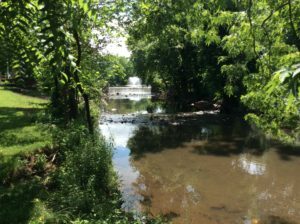 For the last few years I have been attending the Rutgers sponsored, ‘Annual Sustainable Raritan River Conference’ and was introduced to the people and effort dedicated to improve the water and land that make up the Raritan River basin. It was strange at first to hear someone else talk about my river. There was a moment of concern, a tinge of jealousy, that my ownership of the river was being usurped by strangers, some not even native to New Jersey. I soon realized I was among kindred spirits. It was like meeting long lost relatives….. whose company you sincerely enjoyed. Each member contributed a critical piece of the puzzle, whether a citizen, volunteer or a degreed scientist, each perspective complimented the other, and occasionally there was the discovery of a piece no one knew was missing. The symposium took the threads of individual effort and wove them into a whole cloth. I was pleasantly surprised, the focus of the conference dovetailed perfectly into my goals and objectives. It also prompted me to revisit what I hope to accomplish with my images and words, given the current status of New Jersey’s relationship with its natural treasures. Today New Jersey enjoys a natural inheritance that is the sum of the legacy left by generations of agrarian, industrial and residential development. Sacrificed in the name of progress, our natural and wild treasures are reputed to have been diminished to a vanishing point in the wake of the great human juggernaut. 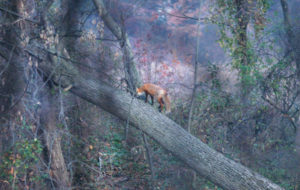 However, despite New Jersey’s recurring reputation as the most densely populated state in the union, wildlife is found to proliferate along its river corridors, highways, woods and fields. Much of this wildlife existed before the establishment of farms, whose disappearance falsely signals the surrender to unabated construction and development. The farms and cows are actually late-arriving interlopers, highly visible and used as a convenient but inaccurate measure of our intrinsic wild and natural resources. It is the presence or absence of cows that form the basis for politically subjective land use decisions. Even the most ardent nature-oriented residents are often oblivious to the richness and distribution of this state’s natural treasures. Regional areas, reputed as nature destinations, add to obscure our natural treasures as their existence implies an absence of nature except where designated. 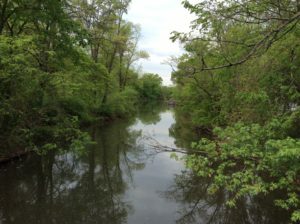 Combine this with the perspective of the nature-neutral and nature-oblivious residents and it is understandable how the nature sterilized image of New Jersey arises from within and grows with distance to earn a national and global reputation as “the ghost of nature past”. Against this background my photographic intentions range from historic documentation of ephemeral wild moments to portraiture revealing the energy and dignity of the creatures that covertly exist among us. What the camera misses the words capture, what the camera sees the words enhance. The articles are a blend of literary flourish embedded with scientific information as much for entertainment as to arouse curiosity. I wish to create a gravitational pull of curiosity that draws the reader to seek deeper knowledge. Hopefully some youngster will be intrigued enough to pursue more detailed information and perhaps launch a career in science. One reason New Jersey’s natural treasures remain hidden in plain view is because of prejudice and limited expectation. The best way to remedy this, is to change the lens through which our natural world is viewed. I do this by presenting stories and information from unique perspectives, along with images of wildlife most have never seen and many more don’t believe exist so close to home. When I consider my place in the effort to restore the rivers, I see me operating on the interface between art and science. I walk that line to help transition attitudes and open eyes to a new reality fostered by creativity and imagination. 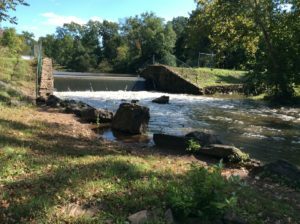 Rutgers fish camera at Island Weir Dam on the Raritan River is now online. In working on my project, I plan to provide a detailed chronological report of the specified site over a period of one complete annual cycle. Secondly, I will take photos to document any changes – or lack of changes – with the passing of seasons, and to bear witness to human intervention, whether it be positive or negative. For example, has any work been done previously to prevent erosion of the stream? Or, what are the effects of littering/ dumping in regard to stream health? I am looking forward to being an active observer of the ‘big picture’ as well as the minutiae of this specific site. Because I am a life-long gardener, it is patently obvious that my garden ‘talks to me’ – I learned that from my Mom. One needs to learn to observe and interpret the sometimes subtle and sometimes obvious messages that nature sends out. For example, a plant may not be partial to a planting site and thus sends out runners or shoots to a more appropriate placement and then a new plant pops up in the more favored location. Needs more sun? Wants higher or direr ground? Example: day lilies don’t like to be in the vicinity of lilies-of-the-valley and they also don’t tolerate any mulch…. With this in mind, I want to to enter into that active ‘observing/listening’ relationship with a stream habitat, which will be slightly different from one with a suburban garden. But I suspect that some (many?) of the same or similar skills will apply. And third, I want to create a written narrative of my relationship with the site, which I hope will be a meditation on the ‘how’ and ‘why’ of a more intimate connection with the wild part of nature that surrounds us. How can we become more active and aware observers and listeners, in order to be able to honor the wildness in nature? And how can we utilize that in order to attain a closer, more authentic and honorable connection between earth and human, to acknowledge that wild part that connects rather than separates us? A bit of a delayed and bumpy start …. Given that I wanted to do a stream assessment, the first order of business was to get some training in that field of endeavor. 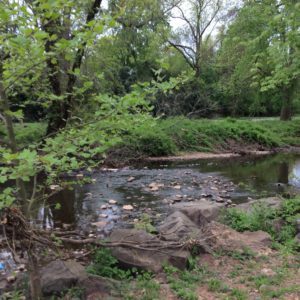 To that end, I participated in a Visual Habitat Assessment training program offered by the Lower Raritan Watershed Partnership that took place on 21 May 2017 at the Lawrence Brook. It was led by Heather Fenyk and those of us in the group learned how to assess stream quality utilizing a very helpful and specific set of guidelines that include water conditions, stream measurements, and stream characteristics. In addition, we also were introduced to ‘high gradient monitoring’ that has as its focus such parameters as embeddedness, sediment deposition, channel flow, velocity/depth, channel alteration, bank stability, etc. My mind’s eye was awakened to the plethora of detail that could so easily be passed over, if one’s full attention to detail is not called into service. It was a wonderful learning opportunity and I was so glad that the opportunity had been afforded to me to learn in this very supportive and educational context. It is my opinion that we learned from the group leader, from the assistants and from nature itself. It was an experience that has stayed with me – I was so impressed by how the gifts of science and observation we who inhabit that green planet that we call home can both inhabit and commune with earth, water, sun, and sky. We need to be silent, to look, to listen, to be, and to be at ease so that the earth’s signals can fill us with wonder. My next step was to find out exactly where the stream was located, obviously. But this task proved much, much harder to achieve than would be expected. 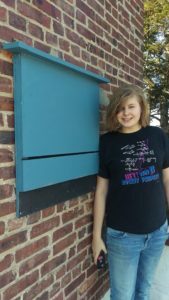 After contacting several people over a period of several months, the site coordinates were eventually sent to me by Mr. Robert Hughes, the Watershed Ambassador WMA 9, on 30 October 2017. Progress! The third step was to do a reconnoitering mission to the site – more about that in a moment – and finally, to arrange for an ‘official first visit’, in the company of another environmental enthusiast, so that the first official set of measurements could be taken. It was strongly suggested by both Michele Bakacs and Heather, with an eye toward safety, to develop and utilize a team approach for site visits. Two people had been recommended to me who might be willing to visit the site with me; I contacted these two people and because of timing, only one was able to co-ordinate with me for the site visit. That first official visit took place on 2 December 2017, with Carolyn F as the second member of the site visit team. So begins the project – it will continue over the course of an entire year, from December to December, so as to be able to capture the feel of the site and to develop a relationship with nature’s rhythm at this particular site. Wish me luck. Prior to the official start of my project, I wanted to locate the site on my own and to reconnoiter it from a very practical perspective: aside from the spatial co-ordinates, what was the easiest, safest, most direct route to the site? Is parking available? How safe/reachable is the site from a public safety perspective? Is the site easily accessible via vehicle? On foot? Are there walking trails? Are they cleared / easy to negotiate? Are there other accommodations? Is the site under the care of any public entity? Are there man-made structures in the vicinity? If so, what purpose do they serve? My first unaccompanied visit to the site was purely for reconnoitering. The part that I visited is easily accessible from Rte. 28 in Middlesex and there is a small parking lot available that fronts the Ambrose Brook. (It turns out that I was not quite at the coordinate site, but within walking distance of the GPS coordinates. More about that later.) While seated in my vehicle I waited for a few moments to get my bearings: there are paths that lead in both directions, one that parallels Rte. 28 and another that cuts back into a residential area. 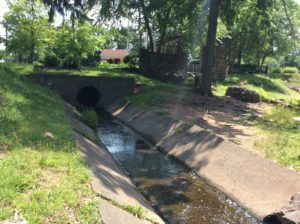 Part of the path is paved, then gives way to some well-trodden dirt walkways that follows the contours of the stream as it meanders its way through the suburban area. There is a small park with a pavilion, a suspended observation / fishing deck that is handicapped accessible, and a portable potty adjacent to the parking lot. Farther down, barely visible from the road, is a lovely foot bridge that crosses the stream from the small park area to a rather dense suburban area. 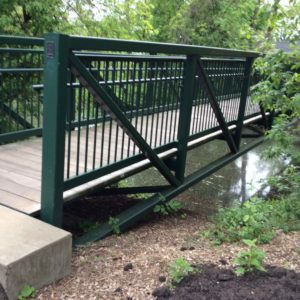 The bridge is made of metal, quite sturdy, and provides a beautiful vista in both directions of the stream. Exiting my vehicle, I walked farther down along the part parallel to Rte. 28 and observed a small but lovely waterfall that allows for the swelling of the brook during times of heavy rain. There are two drains, presumably for rain run-off, that deposit water into the brook. One is a cement structure with a grate that protrudes from under Rte. 28 and the other is a slightly battered metal pipe that extends from underground over the brook. During that first visit, neither drain had any appreciable amount of water to contribute to the brook water capacity. In regard to vegetation, being that it is winter, the ground is frozen hard but the water from the brook is not frozen. The grass is brown and dormant, fallen leaves are all around and the trees are bare, sleeping as they should on this cold winter day. Few birds made their presence known and the only sounds were those of the quietly gurgling brook versus the distant hum of the traffic less than one block away. A lovely memory and observation came to me from the past. One of my acquaintances from years past is a lovely Native American woman; if I remember correctly, she is of the Cree tribe. In speaking of the turning of the seasons, she noted that within Native American culture, in her tribe in particular, winter is of great value because it gives members of the tribe both the time and the space for storytelling, for being with family and tribe members in close proximity, for listening and learning, for observing, for working on and teaching traditional crafts to the younger generation, for making music and singing, for the passing down of valued and cherished information such as family and tribal history, tribal traditions, myths and legends, for sharing the lessons that are needed to pass from one stage of life to another, for maintaining a way of life. She also emphasized that winter is so important to nature because it is a time of somnolent rest, a time to retreat inward, to focus on the completion of one cycle before embarking on the renewal of spring and the start of yet another growing season. As I wandered the bank of the Ambrose Brook on that cold and quiet winter day, I pondered the lessons that await me in this project. The air was cold and I felt a quiet sense of contentment and anticipation, a turning inward that my friend had indicated that is one of the gifts of the winter season. What other gifts would nature bestow upon me if I could just be still, wait, observe, and listen? Ready, set, go! This was a cold and brisk, partly cloudy, not unpleasant day for the very first ‘official visit’ to the site; I was accompanied by Carolyn F, a valued member of the assessment workshop whose name had been suggested to me by Heather of the LRWP. We communicated several times via e-mail and then met on this Saturday in order to put into practice the skills and formula that we had learned back in May. It turns out that this environmental buddy had a bit more on the ball than I did, for she pointed out to me that the actual site of the GPS coordinates was a bit farther removed from the one that I had scoped out on Rte. 28. After texting back and forth, we finally met at the appointed date and time at the GPS location; both of us came prepared, she more than I. Her waders served her very well, given that we did a practice run of habitat assessment using the study sheets provided at the workshop. We did a quick reconnaissance of the site via the latitude and longitude numbers, which is located in a residential neighborhood a bit farther removed – about two blocks or so – from Rte. 28, close to a modest children’s playground. We walked the site, she took some photos, then we decided to head for the other section closer to Rte. 28 in order to try our hand at working through the assessment sheets as a practice run. Using all the equipment and measurement tools provided by the Lower Raritan Watershed Partnership – metal ruler, flag markers, floating rubber duck, thermostat – we happily set to work on the task, starting with the ‘general sheet’, then working through ‘water conditions’, and ‘stream measurements’ (width, depth, velocity). Sounds fairly straightforward, right? Well, what slowed the process at this point was that the measurements are required to be taken using the metric system and not the standard American system of inches, feet and yards, including centigrade versus Fahrenheit readings. Arghhhhhhhh…… Needless to say, the conversions slowed us down just a bit but Carolyn’s phone (with calculator) turned out to be a most vital component of our visit. We did some of the calculations on the spot and then later at home I checked our numbers and completed the conversions. Our tasks included wading into the stream – her waders and my duck boots came in very handy considering the distance and depth – and I appreciated very much having a buddy to ‘compare notes’ to take all the measurements and come to a shared decision in regard to stream characteristics and visual assessment of gradient factors such as epifaunal substrate, embeddedness, sediment deposition, channel flow, frequency of ripples, and the rest of the categories. We measured out our required distance – 50 meters in either direction – placed the flag markers, then got to work. The task was engrossing and the suburban context faded into the background as we assiduously worked our way through the assessment. Even though the natural habitat was in full winter mode, I became aware of the subtle shadings of sound, color, texture, movement and stillness. For example, the floating rubber duck signaled the literal ebb and flow of the stream with its bobbing and stalling as it responded to the currents and cross-currents of the slowly moving water. At times it got caught in a pocket of calm, and then with a bit of encouragement from us, rejoined the water’s energy to make it to the final point of our measures. In observing the little rubber duck’s movement, its vibrant yellow color so visible to our human eyes, it became for me a bit of a metaphor, in that it was floating on the surface of the all-encompassing stream, seemingly unaware of its insignificance vis-à-vis the natural world. We humans ‘float on the surface’, unaware of our insignificance over time in regard to the pulsing of the planet beneath our feet. Alas, our interventions often are negative, considering how overpopulation, pollution, and other forms of contamination interfere with this pulsing, as our lovely green planet hurls itself through the universe, the planet itself insignificant in the greatness of space. Carolyn and I utilized our time well: we were at the site for approximately two and a half hours, taking measurements, comparing our individual observations, appreciating the subtleties of the winter landscape. And just one more observation. We both noted that the area was relatively clean of human garbage, trash, and other forms of detritus, which was a pleasant surprise for me. Given the site’s proximity to the road, the parking lot and rather dense housing, I honestly had expected there to be a stronger and more visible human footprint in the form of various forms of waste – trash, paper, cans, bottles, old tires. But the area is fairly clean! 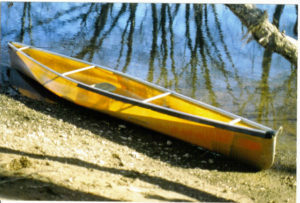 At the end, my environmental buddy suggested that a visit for the purpose of kayaking might be a doable undertaking at some future time in the warmer months, in order to explore the area upstream of the given site. That idea will be placed on the list of possibilities for another day. With that we each went our separate ways. It was good to be heading home, with the heat flowing in the cab of my vehicle. “The best laid plans….” Now that this project had finally launched, I was anxious to establish a steady rhythm in regard to my site visits. And in addition, there was contact with another environmental enthusiast, who signaled a sincere willingness to serve as my exploration buddy. Susan E. had volunteered to accompany me on further adventures; she is perfectly qualified and suited for the task, having developed an environmental project of her own, which in truth, was the inspiration for my own. We decided that an end-of-the-year visit would be an appropriate means to both close out one cycle and look forward to another, Janus like, in anticipation of a yet another change of season. Alas, the plans fell through because I came down with a virus and was out of commission for the good part of a month. So… on to the New Year and the start of another cycle. We made our way to the lovely footbridge, a steel structure that provides an excellent vantage point to look in both directions, both up and down stream. Some fauna were present, a few ducks and geese on the surface of the water as well as a some fish that lazily lolled in the current below. I was struck by the sense of solitude and peace of this beautiful place, in spite of the proximity of suburban life so close. We continued on the bridge to the other side, then made our way carefully along the opposite bank. The footing became quite muddy and unstable but the view from this far side of the stream offered the opportunity to reclaim a perspective based on a more unenhanced version of the site, one not as manufactured by human intervention. Nice! Our visit included stopping for Susan to take some photos, then we crossed back to the parking lot and took our leave. As predicted by the US Weather Service, it has been a cold and long winter, followed by a cold and wet spring. I stopped by the Ambrose Brook today in the hopes of spying a bit of change, whether in the early budding of trees, the minute sprouting of grass, a return of more birds with their flutters and chirping. Any harbingers of spring? No such luck, not yet. However, this visit provided me with another opportunity. It was a cold and mostly cloudy day that served for me to stand in quiet solitary contemplation on the observation platform. Not to be deterred, I chose to focus attention on a small island that is at the center of the brook and attempt to take note of the visual minutiae that delineate the island’s subtle shadings. The colors are primarily brown and green, with varying shades of tan and grey. Black lurks in the shadows and slivers of flickering sunlight shoot arrow-like through the trees, shrubs and brambles. Wind ruffles some fallen leaves that cling to roots and branches, decaying evidence of a season long past. Some ducks paddle quietly along the perimeter of the island and barely take note of my presence. Perhaps they have become inured to human presence in general or through experience have learned that the imposing, vertical mammals do not have the habit of crossing the water barrier between solid ground and the little island to their backs. They occasionally glanced in my direction and then continued on with their creek cruising. 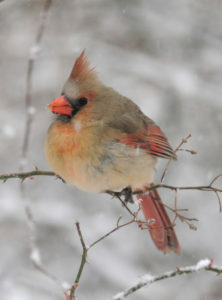 Not a bad life, given that their feathers and a layer of winter fat provide ample protection from the water and wind. My observation also took in the water level, higher than in previous visits, presumably from early spring melting and run-off. 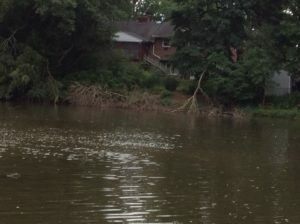 The brook water was a muddy brown and lapped at the edges of the island; there was some bank vegetation that was partially submerged and partially above water level. As with the previous visit a bit upstream, trees on the island threw off roots, some as thick as the fists of a prize fighter, to sustain their height. There was no indication as yet of buds forming on the trees, none that I could see from the distance, standing on the observation platform. The quiet of this visit on this end-of-winter day comforted me, offered a soothing message of tranquility, endurance and the abiding wisdom of nature’s continuing cycles. Spring has finally arrived at Ambrose Brook, there are many indications that the season has turned in alignment with the earth’s rotation and tilt. I visited the site at around 10:30 am and stayed for about one and a half hours. My time was spent in observation and contemplation of the natural environment as well as the effects of human intervention. For starters, the leaves are starting to appear on all the trees – finally – the grass is starting to appear less stubbly. As a result of the burgeoning leaf cover, the ability to see across the brook will be quickly diminishing in the coming weeks, I surmise. The water in the creek seems to be moving at a bit faster pace, probably because of the amount of rain that has been falling in the last week or so. I walked for approximately a quarter of a mile in each direction from the parking area off of Rt. 28 in order to determine what changes, if any, had occurred because of the winter weather. What I observed in the area closest to the segment identification by latitude and longitude was some washing up and / or tree fall from winter storms. 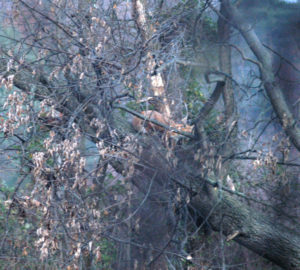 Some of the fallen timber had been ‘cut down to size’ by someone wielding a chain saw, most probably a worker from the local DPW; the logs and branches were piled up on the left bank to a height of approximately three and one half feet. This pile of wood and leafy debris may prove enticing to some small furry creatures in the future for a lovely, cool, and protected nesting or burrowing place, if it is left as it is. I was able to get around the pile and continue my observation but the brambles have started to fill in and the slog got a bit more difficult. It was evident from where I was walking on the bank that there is a type of flood plain for the creek; the flow exceeds the bank where the creek takes a meandering turn toward the left. The footing became quite muddy and the brown grass left over from the fall manifested the effects of flowing water – lovely swirls and whorls that give the impression of a lazy aquatic ballet performed upon the welcoming earth with the literal ebb and flow of the creek’s capricious visits during the winter months. The brook’s water has now receded from the flood plain and is within a channel that has definitive banks, although the height of the banks varies at different points on my observation path. Taking a turn in the opposite direction from the parking area, parallel to Rt. 28, the view is idyllic – a meandering brook with a few surface ripples that give off a low and pleasing hum, an overhang of greening trees, grass appealing to the eye and calling for the tread of bare feet, a small waterfall, and some waterfowl – Canadian geese and a few mallard ducks who were more than willing to share the space and beauty of the moment, either the ones who were on the banks of the creek or those who were enjoying the cool embrace of the creek’s sultry flow. In spite of the minimal traffic noise emanating from Rt. 28, this was place and moment that could be described as a feast for the senses. The gift of sight that captures the nuance of color and form, that of hearing, the sound of birds and brook, that of touch, that encourages physical discourse with so many material forms as well as the ephemeral contact of wind on my face. And the olfactory experience is not to be denied, in the sweet reminder of flowering trees and bushes that contrasts with the musty and not-to-be-denied odor of the languorous creek within its uneven banks. And the experience of taste? I was not expecting to add that to the list, but a bug unceremoniously entered my mouth and with an unanticipated crunch, the bitterness of the insect’s demise forged its way into my consciousness. Ugh. So much for poetic contemplation of this idyllic scenario. In regard to human intervention, in addition to the chainsawed fallen timber, there was evidence of tidying up in the recently mowed grass along the banks, mulch piled and spread along the public walkways, and a cheerful DPW worker raking some leaves. There was some human traffic; two men were fishing off of two different piers with hand rails – handy for resting their fishing poles –, and a young mother ambled briskly with her toddler son who had no interest in staying in the stroller but rather preferred to trot along beside her. The visit was enjoyable, refreshing, renewing. 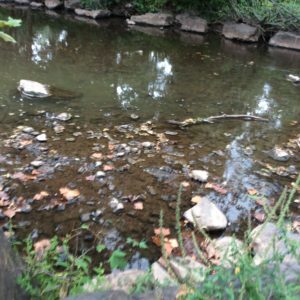 Some ideas for further exploration are to identify the trees and shrubs in the area, to focus on bird species that are present, and perform another official habitat assessment of the creek utilizing the format provided by the Lower Raritan Watershed Partnership. And the possibility of a kayaking expedition offers yet another challenge. Onward! About Margo Persin: I am a retired Rutgers professor who needed a project. I took the Environmental Stewards course offered through Rutgers and was inspired to get back in touch with this beautiful green planet that we all call home via a focus on water. I grew up on the Lake Erie shore, the northeast Ohio coastline, so the pull to return to a partnership with water was a logical and autobiographical one for me. Also, during my years as a professor, I spent several years in Mexico and was able to observe firsthand the devastating and catastrophic effects of no access to potable water. Water means healthy communities, healthy crops, healthy kids. Water is life.